General (Ret) David H. Petraeus joined KKR in June 2013 as Chairman of the KKR Global Institute. He was made a Partner in December 2014. The Global Institute supports the KKR investment and thought leadership processes, focusing on geopolitical and macro-economic trends, as well as environmental, social, and governance issues that shape the investment climate. General Petraeus also serves as a Visiting Professor of Public Policy at CUNY’s Macaulay Honors College, as a Judge Widney Professor at the Univ of Southern California, and as a Non-Resident Senior Fellow at Harvard University’s Belfer Center. Prior to joining KKR, Gen. Petraeus served over 37 years in the U.S. military, including tours in Cold War Europe, the United States, Central America, Haiti, Bosnia, Kuwait, Iraq, Afghanistan, and the greater Middle East. He culminated his military service with six consecutive commands as a general officer, five of which were in combat, including command of: the 101st Airborne Division (Air Assault) during the fight to Baghdad and the first year in Iraq; Multi-National Security Transition Command-Iraq over 15 subsequent months; Multi-National Force-Iraq during the Surge from February 2007 to September 2008; U.S. Central Command from 2008 to 2010; and the International Security Assistance Force in Afghanistan from 2010 to 2011. 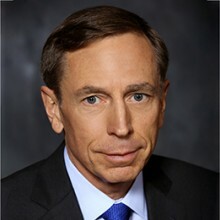 Following his service in the military, Gen. Petraeus served as the Director of the CIA, leading the Agency during a period that saw significant achievements in the global counter-terrorism effort, initiation of a comprehensive strategic plan to guide the Agency, conduct of an effort to increase worldwide human intelligence coverage, establishment of the Agency’s Economic Security Center, and commencement of numerous initiatives to increase the Agency’s investments in its human capital. General Petraeus graduated with distinction from the U.S. Military Academy and subsequently earned MPA and Ph.D. degrees in international relations from Princeton University’s Woodrow Wilson School of Public and International Affairs. General Petraeus has received numerous U.S. military, State Department, NATO, and United Nations medals and awards, and he has been decorated by 13 foreign countries, including the Military Merit Order, First Class, from the United Arab Emirates.